I tried a new recipe yesterday morning. It's straight out of Betty Crocker. 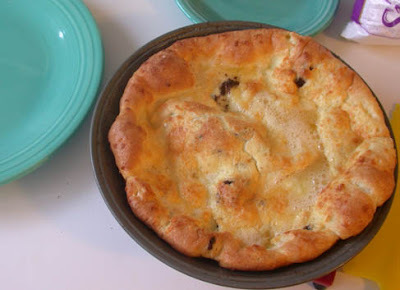 John and I love Popovers, and this is basically a popover, just one big one in a pie plate. lightly beat 2 eggs and add 1/2 cup milk, 1/2 cup all purpose flour, and 1/4 tsp salt. don't over mix. Make sure the butter coats the pan and then pour the batter in. Bake 25-30 minutes or until puffy and a deep golden brown (the less you bake, the eggier the texture is). 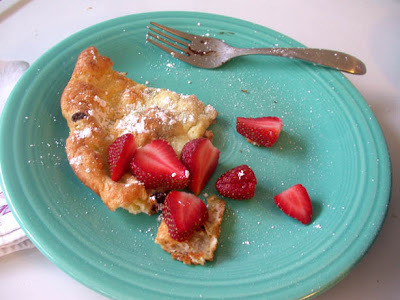 I added chocolate chips (go figure) and topped with strawberries and powdered sugar. It was marvelous, and requires a lot less standing around than pancakes - although it is fun to watch it puff up in the oven.